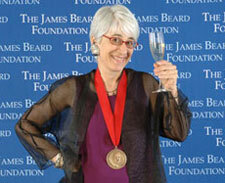 Lorna Sass wins the prestigious James Beard Award in the healthy focus category. Now in its eighth printing! Thank you for visiting my web site. I have much exciting news to share. Pressure Cooker Featured in the New York Times Magazine! On December 22, 2013, the pressure cooker and I were featured in the Sunday Times Magazine. What a thrill! 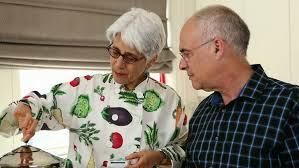 In this picture, you can see me showing New York Times food writer, Mark Bittman, how to use the cooker. To be able to spread my enthusiasm for pressure cooking in a such a public way was the fulfillment of a lifetime dream. The full article and recipes are all available on line. As you will see from the accompanying videos, I had lots of fun showing Mark how to prepare Beef Short Ribs in 30 minutes under pressure, Lamb Meatballs in Greek-Inspired Tomato Sauce in 5 minutes under pressure, and Porcini Risotto in 4 minutes under pressure. I’d love for you to leave a comment in the space below the article. My goal is to have a pressure cooker in every American kitchen. Because you can get a meal on the table so quickly with a pressure cooker, you’ll find yourself eating more healthy meals at home more often. As if that weren’t enough good reason to have one, you’ll discover that the “pc” is also ecologically sound because it is so fuel efficient. Since the article appeared, many people have asked me what pressure cooker I was using, so here’s the link to find out more about it. I am delighted that Harper Collins has brought out a revised edition of the book that returned the pressure cooker to many American stovetops. It was published in early November and is often on Amazon’s Top-100 cookbook list. “Anything Lorna Sass writes is a pleasure to read…She makes the cooking methods seem so easy that anyone who doesn’t own a pressure cooker will want one right away,” says Marion Nestle on the book jacket. When this collection of quick and tasty vegan recipes was published in 1997, vegan wasn’t a mainstream word, so we used the word vegetarian instead. I’m so happy that the title now says just what the book is: Short-Cut Vegan. The updated edition was published by William Morrow and is already in its second printing.! After Whole Grains Every Day, Every Way won the James Beard Award last year, I was excited about doing a follow-up volume. My editor at Clarkson Potter, Rica Allennic, proposed a companion book filled with ideas for quick cooking wholegrain meals. 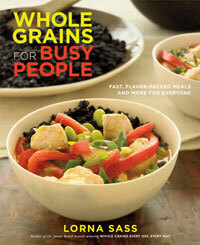 I came up with the title Whole Grains for Busy People, which just about says it all. It was published to great acclaim in January 2009. Use it to make your healthy-eating New Year’s resolution come true. 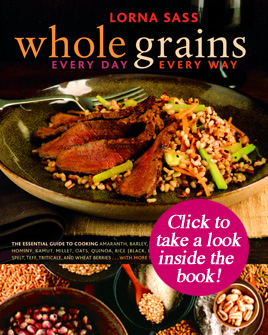 Whole Grains Every Day, Every Way is my thirteenth cookbook and represents my ongoing interest in whole foods. Whole foods require minimal processing and benefit us and our planet in many ways. If you are a newcomer to whole foods, learning more about whole grains is a terrific way to begin making a transition.